Get to know Wesabe, get to know your money! 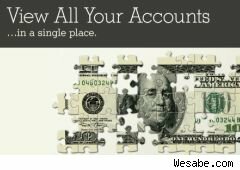 Wesabe is an amazing useful personal finance site which provides access to all of your checking and savings accounts under one site in order to better track your finances. I had a chance to chat with Marc Hedlund, the CEO of Wesabe about security, user rights, features, upcoming and the community focus of this excellent site. This article is longer than our normal fare but stick with it if you want to get to know your money using a cool online tool. The first thing you'll want to know before handing over your banking information to a company is how secure they are. Wesabe provides its users with industry standard encryption to protect your financial data. Unlike their competitor, Mint who uses a third party to handle security and data Wesabe has taken the processes in house and developed their own system. The decision is actually a great one when it comes to security and the rights you have over your data. Marc shared with me that one of the main reasons they built their own system was to be able to offer users a Data Bill of Rights, allowing you to completely delete your data at any time, something third party vendors would have kept. Aside from keeping your passwords and financial information from a company you don't have a business relationship with the Wesabe system also has the ability to get updates about your transactions as often as your bank provides updates providing you with more accurate information. Another cool feature of being a Wesabe user is that there are currently 4 ways to upload your data based on how much information you want to trust Wesabe with. Three of these methods don't require that you provide Wesabe with any of your banking credentials and the fourth is an automatic uploader which logs in and updates your account information throughout the day after you provide your login information to Wesabe. Many users begin with the manual upload and as their trust in Wesabe grows, move to more automatic methods of uploading. The fully automatic uploader came about from user requests and is the method that Marc uses to upload to Wesabe. The defining feature of Wesabe is the community approach it brings to personal finance. Members of Wesabe all benefit by sharing their information, these range from the saving tips related to items you buy or places you shop or a recommendation to switch to a cheaper mechanic that users near you rate highly. Marc finds the community of Wesabe to be a defining feature because, "Anyone can make a chart, but it won't reduce stress or cheer for you when you pay off your debt or buy a house. People do that way better than a chart can." Another part of the community are groups, where you can link up with others trying to pay down student loans, save for a house or create an emergency fund; gaining from their shared knowledge. As far as the actual usage of Wesabe goes, users can tag their transactions based on what they bought including the ability to split up a transaction to multiple tags. Once your items are tagged you can begin comparing your income v. spending, identify areas of wasteful or excess spending and even get account balances from your cell phone. Within 5 minutes of connecting one of my bank accounts I found a $7 bank fee that had eluded me for the past few months because Wesabe recognized it as a potentially wasteful fee. One area which Wesabe is currently lacking is that it doesn't have a true method to track student and car loans, but many users have found that they can create a cash account with a negative balance to represent loans they have. If you want to know more about using Wesabe check out their numerous how to videos. During my interview I found out about some cool upcoming features for Wesabe. Wesabe will soon be rolling out new graphs to more easily allow users to track spending and monitor their income. I have been trying out these new graphs for the past few days and I am very impressed with them. They are very handy for anyone with multiple income streams, as they easily show what percent of your money comes from where. Even more exciting for all of you iPhone users is that Wesabe is internally testing an iPhone app which can even be used as an uploader. Marc also let me know that Wesabe is looking at implementing a method for users to track loans including the ability to factor in interest rates in the future. Another cool feature Wesabe is working on is the ability to use two logins to access one account so that spouses don't need to remember their better half's password. I can't wait for this to roll out. After chatting with Marc and using Wesabe more regularly over the past few days I have a new found appreciation for it. The flexibility, automation and community aspects provide me with an excellent personal finance tool, in fact if Chuck Norris were a personal finance tool he'd be Wesabe!